Almost forgot to pay tribute to Bobbejaan Schoepen, one year after he sadly passed away. Luckily his beautiful granddaughter Femke Ganzeboom-Schoepen already did – when Bobbejaan still was among us – with a sweet and relaxed interpretation of granddad’s classic track ‘Monsieur le Vagabond’. French actress Clémence Poésy sings a duet with Miles Kane on his just released solo-album. You might know Miles from Last Shadow Puppets (their album cover is so gorgeous) and The Rascals. Clémence is of course in the Harry Potter movies, 127 Hours and In Bruges. If you see this video of them doing the song (in English) together, you migth think they’re long time friends. They are not, Miles had not heard from Clémence prior to this duet. Someone from the record company met the actress in Paris, said Miles was looking for a singer and askes if she was up for it. Kane’s reaction: ‘You stupid prick!‘. But it all turned out well. In some reviews, the song is compared to Serge-and-Jane-duets. Hmm. Can we agree on saying that Brigitte Fontaine is an acquired taste? The grande dame of the odd chanson started her career in 1965, sang traditional chansons but made things more interesting for herself by working with The Art Ensemble of Chicago, Jacques Higelin, Sonic Youth, Stereolab and a whole lot more. She’s in her 70s now, but does not tone down. ‘I am God’s nightmare’, she, erm, ‘sings’ on her most recent offering, the duet-stuffed L’un n’empêche pas l’autre. Her partners have, just like her, instantly recognisable voices, like Arno Hintjens (great track! ), Grace Jones (they do an Arab rework of the jazz-standard Caravan together), Higelin of course, M(athieu Chedid), Christophe, Bertrand Cantat and Emmanuelle Seigner. You can see what she made Mrs Polanski do for her track in the video above. Acquiring from the top of your lungs, yessir. Without Mordi and his fabulous Blowupdoll-blog, my own blog would’ve never existed. Blowupdoll is the blisteringly beautiful mother of all blogs dedicated to singing girls. So it was a huge honour when Mordi asked me to put together a mix-tape with my favourite ‘dolls’. I chose only Dutch meisjes, singing in Dutch, English, French and even German. My tape, and a lot of other fantastic zips with gorgeous girls, can be found HERE. Pictured is, of course, Mariska Veres of Shocking Blue. You can hear her marvellous voice on two songs on my ‘tape’. First there was Dingue Dingue Dingue. Then there was Non Non Non. And now we have Bang Bang Bang. All good things come in threes. And Claire Denamur is a very, very, very good thing. 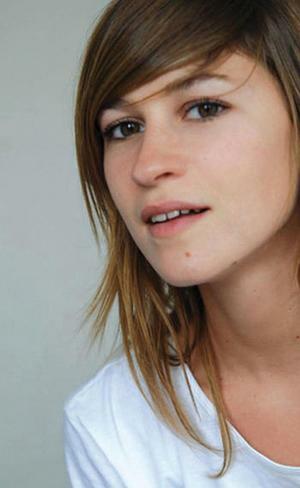 The singer with Dutch, Argentinian and French roots blipped on our radar in 2009. Her first album still is a gem, and from the sounds of it, the sophomore cd will be too. On the just-released EP are four songs, the aforementioned summer hit, two ballads and a very nice rendition of Nine Inch Nails’ Hurt, inna Johnny Cash-stylee. Is it a coincidence that the best contender for French summer hit is this track? I think not. Marine Pellegrini is the sweet husky voice of N’Relax, a jazzy band from Lyon that sound like a cross between early Björk and Dutch diva Schradinova. They released two albums, the most recent is more experimental, less breezy. I bumped into this band while looking for songs about bicycles. And guess what. Find free mp3s and more info on N’Relax here. See a nice video here. And see another nice video here, in which Marine channels her inner Camille. Gimme a board, messieurs. Pour les grandes vagues et les surfer garcons (et filles), here’s a twangy big-ninth-version of Charles Trenet’s „La Mer“ by Psycho Tiki entrepreneurs The Aquamarines, and the probably most liquid version of Serge’s & Jane’s „Je t’aime (moi non plus)“ ever heard, performed by Berlin’s number one surf guitarist and lounge expert Kahuna Kawentzmann – the German „Kawentzmann“ translates as a rogue wave you shouldn’t even try on a Big Wednesday, got my drift, kids? Wet name choice, and even your girlfriend may get instantly … okay, forget about that. Both tracks from the stunning compilation „Beyond the Sea – The Surf Instrumental Bands of the World Fearlessly Expand Their Repertoire“. For now: Wahini! Extra: The original “La Mer” plus a few cover versions, including Cliff Richard en francais, Kevin Kline’s fine cover from the movie “French Kiss”, and a very charming mid-60s bubblegum adaptation by Francoise Hardy. Would you buy a used Jane Birkin record from this man? 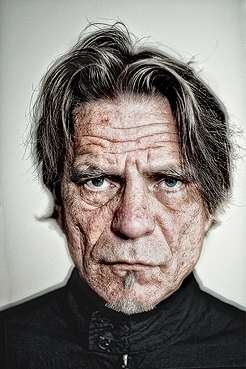 Berlin-based guitarist Kristof Hahn, who has played with the likes of Alex Chilton, Tav Falco, or Chris Spedding, is now touring with US 80s noise legends The Swans and hitting Munich tomorrow, May 19th; the pic actually is from the tour poster. Living in the Rue Verneuil of his mind, Hahn also has quite a francophile schtick that can be heard on his recordings with Les Hommes Sauvages, and he’s also a great storyteller, provided that you speak German: Four years ago, he told a few Serge Gainsbourg anecdotes during a gig in Vienna before continuing with a solo version of Serge’s Je suis venu te dire que je m’en vais – deadpan humour plus some sharp, grungy licks the original song lacked for a few decades. ‘Ik dans dus ik besta’ is a Dutch translation of ‘Je dans donc je suis’, a song written by André Popp for Brigitte Bardot. She had a hit with it in 1964, this cover by List is from her debut-album from 1966. I recently came across this version, and thanks to Sylvester and Paul, I can post it here. 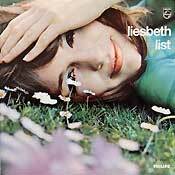 Liesbeth List, for the uninitiated, is Holland’s most respect chansonniere. She made her tv-debut in 1964, duetting with Gainsbourg. Later, she recorded several chansons in French and translated versions. Songs by Barouh, Gainsbourg and most famously, Jacques Brel. I had the distinct pleasure to meet her at the presentation of the Filles Fragiles #2 compilation, that features a Gainsbourg-cover by her. This Bardot-cover was never released on cd, oddly enough. You know Rammstein. This German band mixes metal with (homo-)eroticism, electronics, East-German references, irony, humour and great visuals. Introduction? See here. You might not know Roger Baptist, aka Rummelsnuff. He’s a one-man Rammstein, who recorded several albums under different monikers. He once recorded a cover of Becaud’s Nathalie, on his most recent release Brüder the Gainsbourg-and-Bardot-duet Bonnie & Clyde gets a treatment. Roger gets help from French actress and singer Valerie Renay (pictured).